An all around reliable vehicle, despite simplicity of features. 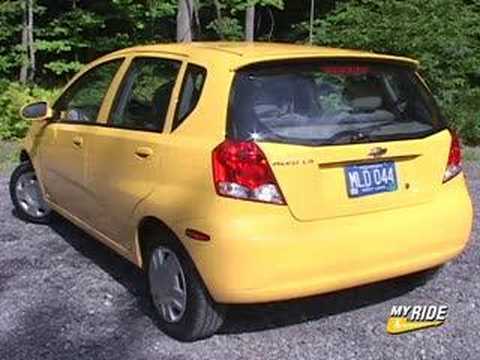 My Aveo is a great car in my opinion. It is simple and comfortable. It is small which really comes in handy if you are in an area where street parking is necessary. It is spacious on the inside with plenty of leg and room overhead. Keep in mind that windows are manual as are the locks which can prove a hassle. The seats are canvas and cloth and are very comfortable and easy to clean. Something in my life that I had to depend on and I could. Its a basic car but excellent gas mileage and I have had absolutely no problems the entire time of owning this car. The performance of said car has also been without a doubt what I needed in a car. Reliability and comfort has got me to and from work since 2004 everyday and it was a 2 hour drive each way so comfort was important along with its features. ON CERTAIN PASSENGER VEHICLES, THE REAR SAFETY BELT CAN BECOME TWISTED. IF THIS OCCURS THE SAFETY BELT RETRACTOR MAY LOCK IN POSITION SO THAT THE BELT CANNOT BE USED. IN THE EVENT OF A VEHICLE CRASH, PERSONAL INJURY TO THE SEAT OCCUPANT COULD OCCUR. DEALERS WILL INSTALL A SAFETY BELT WEBBING GUIDE TO PREVENT THE BELT FROM TWISTING. THE RECALL BEGAN ON OCTOBER 15, 2004. OWNERS SHOULD CONTACT CHEVROLET AT 1-800-630-2438. VEHICLE OWNERS LOCATED IN GUAM SHOULD CONTACT GM CUSTOMER ASSISTANCE AT 1-671-648-8453.